Most of my readers might argue that this news shouldn’t be in the entertainment section but I disagree. This “Oga at the top” video was more entertaining than most of our singers today. The former Lagos State Commandant of Nigeria Security and Civil Defense Corps, NSCDC, Mr. Shem Obafaye, best known for the ”My Oga at the top” phrase, has finally resumed duty as Oyo State Commandant of the security agency. “Hmmm, the website is, excuse me, my Oga at the top knows the website”. He again, cleared his throat and said: “The website remains known to my Oga at the top, so I can’t give you one right now”. 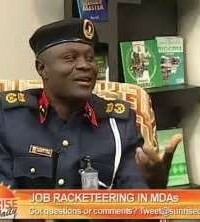 When the presenters insisted that he give a functioning website address of the para-military outfit, he dropped the bombshell: “ww.nscdc that’s all”. Immediately, the interview went viral and has become so popular to the extent that t-shirts with “my oga at the top” insignia were produced and sold like hot cake across the country and even abroad. DJs and musicians also did what they called ‘a remix’ of the phrase. Meanwhile, this latest development has put to an end speculations that Mr Obafaye had been sacked on the orders of the Minister of Interior, who supervises the NSCDC. Authorities of NSCDC had continuously denied taking any disciplinary action against the embattled commandant.